Overview - The sublime adaptation by Jean Cocteau of Mme. Leprince de Beaumont’s fairy-tale masterpiece—in which the true love of a beautiful girl melts the heart of a feral but gentle beast—is a landmark feat of motion picture fantasy, with unforgettably romantic performances by Jean Marais and Josette Day. The spectacular visions of enchantment, desire, and death in Beauty and the Beast (La Belle et la Bête) have become timeless icons of cinematic wonder. I sometimes envy children. Free of the jaded, cynical experiences that mar adulthood, the young are still able to see the world with eyes fresh and new. For children, every sight, or sound, or experience still holds limitless possibilities of wonder and enchantment. For children, there is no man behind the curtain, or hidden trick to the illusion. For children, there is still magic in the air. 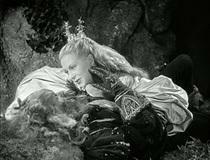 It is with this innocent but often lost perspective, that Jean Cocteau asks his audience to view 'Beauty and the Beast,' his 1946 masterpiece of cinematic fantasy. Picking up where the great Georges Melies left off, Cocteau infuses his images with dazzling effects and mesmerizing beauty, touching the heart and soul in a way that only cinema can, while never once losing sight of the joyous, storybook simplicity that rests at the core of all fairy tales. 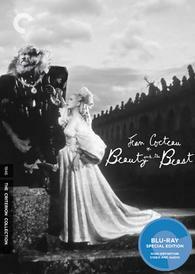 Based on the story by Jeanne-Marie Le Prince de Beaumont, 'Beauty and the Beast' follows a beautiful woman, Belle (Josette Day) who is forced to live in an enchanted castle with a mysterious, animalistic beast (Jean Marais) in order to save her father. In classic fairy tale fashion, the pure-hearted woman slowly comes to see the humanity in her frightening but gentle captor, and true love eventually rises above all obstacles. The story has been adapted to various mediums countless times, and Cocteau stays remarkably close to the original version, keeping the core elements that make the tale so rich and beloved. One key new addition comes in the form of Belle's human suitor, a pompous and arrogant scoundrel named Avenant (also played by Jean Marais), which allows Cocteau to expand upon the drama. It is often said that inside every man is a beast and a prince, a demon and an angel. Cocteau examines this simple idea with nuance and surprising complexity. Fueled by love, the Beast is a conflicted soul, wrestling with his baser, more brutal instincts and his gentle affections for Belle. He is compelled to hunt and is prone to rage, but behind his eyes lie a deep, lonely sadness. On the other hand, the handsome but haughty Avenant lets love turn him into a commanding and violent rogue, fueled by passion and greed. By casting the same actor in both opposing roles, the filmmaker is able to directly illuminate this dueling dichotomy of man within beast, and beast within man, in a beautifully intelligent and ironic manner. Marais shines as both characters, bringing a mixture of touching gentility and brooding savagery to the Beast, and even though mostly seen in a negative light, as Avenant, the actor still creates a well rounded and not wholly one dimensional antagonist. As the angelic Belle, Josette Day shines brightly. Her loveliness and passion extend far below the surface, as she becomes the embodiment of silver screen beauty. The art direction, set design, and costumes are among the most wondrous ever put to film. Whether using real life locations or in studio constructed sets, each frame is filled with loving detail that literally sparks the imagination on fire. The makeup used to transform Marais into the Beast is nothing short of amazing, creating a fully realized, and even to this day, believable character. With the help of cinematographer Henri Alekan, the director captures all of these ornate features through a poetic lens of layered, artistic compositions, angles, and lighting design. Cocteau was much more than just a filmmaker, he was a true artist of various disciplines, and his eclectic skills create a mise-en-scene that is often worthy of being pulled straight from the screen to be proudly hung up in any art gallery around the world. The director imbues the proceedings with graceful images of dreamlike awe. The Beast's castle is a treasure-trove of mystery and delight. Living statues, magic mirrors, and disembodied, helping hands litter the palace, and like a magician, Cocteau creates his effects through "conjuring tricks" of cinema. Sequences are played back in reverse or in slow motion to pull off fantastic illusions and create surreal images of fantasy. Teleportation, smoking hands, and impossible transformations are handled through in-camera, practical effects and wizardry, forming simple but wonderful results that rival even the CG enhanced techniques of today. This otherworldly style of wistful imagination is perhaps no more apparent than in the scene where Belle first enters the Beast's castle. 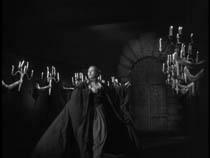 Filmed in ethereal slow motion, the sequence features a shot that shows Belle gliding across a hall as ghostly, billowing drapes cascade over her flowing form. In all the many films that I have seen, from the mainstream to the avant-garde, I have come across very few images that so closely capture the true essence of the intangible, as this one, momentary scene does. Simply put, "It's the stuff that dreams are made of." Despite the mastery and innovation on display, the ending to the film has always struck me as slightly off, and watching the movie again for this review has not changed that initial reaction. While the conclusion is lovely in many ways, the Beast's final transformation doesn't completely work for me. I see where Cocteau is coming from in a thematic and metaphorical manner, but the way it's executed feels rushed and a little underdeveloped. There are also a few lines of dialogue from Belle, concerning her true feelings toward a certain character, that seem out of place and appear to conflict with her previous characterizations, so much so, that even the Beast seems puzzled by her remarks. Still, these are very minor nitpicks for an otherwise marvelous achievement. At the beginning of the film, Cocteau asks us to once again look through innocent eyes. He asks us to open our minds and souls to magic and spectacle. He asks us to choose to believe. It's a noble and fair request, but in truth, it's completely unnecessary. 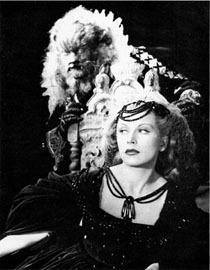 With 'Beauty and the Beast,' Cocteau need not ask at all, for there is really only one way to watch this film. From its first shot to its last, whether we wish it or not, for around ninety minutes, this cinematic treasure gives back what many have long since lost -- the carefree joy and glee of childhood. It gives us back that sheer, melancholy delight of once again resting, heads nestled against a pillow, bodies snugly cushioned under blankets, faces cast by the faint glow of a twinkling nightlight, with our mothers knelt beside our beds, whispering sweet promises of faraway lands, of beautiful princesses and frightening monsters, of incandescent wonders and sparkling stars, of dreams, and dreams, and dreams… It may only be fleeting, and all too brief, but for that rare, transcendent gift, 'Beauty and the Beast' deserves to be on the shelf of every foolish romantic who dares to love, and every foolish dreamer who dares to dream. Criterion presents 'Beauty and the Beast' in their standard clear case with spine number 6. The BD-50 region A disc comes packaged with a booklet featuring an essay by critic Geoffrey O'Brien, an intro by Glass to his opera, a piece by Cocteau on the movie, and excerpts from Cocteau's biography written by Francis Steegmuller. The movie is provided with a black and white 1080p/AVC MPEG-4 transfer in the 1.33:1 aspect ratio. The presentation is respectful but occasionally a little underwhelming. The source has been cleaned up nicely through some extensive restoration and a thin layer of grain is visible throughout. Detail is good but the movie has a soft appearance. This helps bolster the dreamlike intentions of the fantasy, but leads to a sometimes disappointing lack of depth. There are also instances of what appears to be faint, vertical banding in several sequences. Black levels are also problematic, fluctuating slightly and often appearing elevated. Contrast is strong without being blown out. Despite some minor issues and prevalent softness, the cinematography and images presented are simply breathtaking, with some scenes looking very impressive. Though not perfect, Cocteau's masterpiece has probably never looked this good. The movie is presented with a French LPCM mono track with optional English subtitles. The track does a respectable job of preserving the original audio elements. Dialogue is clear and there are thankfully no major crackles or hisses. The singe channel of audio does lack some fidelity and fullness, but still sounds nice for its age. Dynamic range is pretty flat but balance between the score and speech is well done. The music itself is fantastic and fits wonderfully with the images. 'Beauty and the Beast' sounds nice but not great, and the limitations of the original recordings simply can't measure up to modern standards. The film also includes an additional track of Philip Glass's 1994 opera in full DTS-HD Master Audio 5.1, that is discussed in detail below in the supplements section. Criterion has put together a strong assortment of supplements, including some interviews, a nice documentary, two commentaries, and a fantastic supplemental audio track. All of the special features are presented in upscaled 1080i with French Dolby Digital mono audio and optional English subtitles, unless noted otherwise. Commentary by Arthur Knight - Film Historian Arthur Knight provides an informative discussion on the film. Knight takes a rather scholarly approach and gives a detailed account of the movie's production, place in history, locations, influences, as well as some analysis. The historian also discusses several other works by Cocteau and the evolution of his style. Probably of most interest, are the sections in which Knight reads from Cocteau's personal diary written while making the movie. These intimate insights are great to hear. Though a little dry, this is a worthwhile listen for fans of the picture. Commentary by Sir Christopher Frayling - Cultural historian Sir Christopher Frayling sits down for this track. Similar to the previous commentary, Frayling covers most of the basics going through the film's place in the larger context of French cinema, challenges during production, differences from the original story, and the film's lasting influence on later tellings (especially the Disney version) and filmmaking as a whole. Frayling also provides some of his own analysis and offers some more trivia and details on Cocteau and Maries's close relationship. Information is repeated from the other commentary, but there are definitely new insights to be gathered here. Philip Glass's Opera - Included as an optional soundtrack for the film is Philip Glass's 1994 opera. The track is presented in French DTS-HD Master Audio 5.1 with English subtitles, and features musical compositions by Glass accompanied by operatic singing over the film's original dialogue. To put it simply, this sounds absolutely amazing. From a technical standpoint, there is great depth and fidelity and the individual musical elements and cues litter the sound stage in an wonderfully immersive sonic experience. For those unfamiliar with Glass's style, he uses a minimalist approach of repeated melodies and musical motifs which slowly evolve and grow over time. His approach fits perfectly with the images, and this is a fantastic alternate track for those that have already seen the film and are looking for a new way to appreciate it. Screening at The Majestic (HD, 27 min) - This is a nice, retrospective documentary produced in 1995. The doc features interviews with some of the cast and crew and revisits many of the locations used in the movie. A narrator reads from Cocteau's personal diary about making the film, revealing intimate details and insights. Some information on the magnificent makeup, lighting, and special effects are given by the participants and through behind-the-scenes stills and clips from the film. This is a good feature that is well worth a look. Interview with Henri Alekan (HD, 9 min) - Henri Alekan provides some nice details about working on the film and with Cocteau, in this excerpt from a French television program. Alekan describes some of his influences on the movie, such as Gustave Dore and various Flemish painters. Most interesting is the reveal that Cocteau actually wasn't present for the shooting of Belle's father's entrance into the Beast's castle, as he felt his presence jinxed the complicated reverse actions needed for the sequence. Secrets Professionnels: Tete-A-Tete (HD, 9 min) - Makeup artist Hagop Arakelian is the focus of this brief featurette from 1964. He discusses his work while demonstrating his techniques on several actors. Though this has very little to do with the actual movie, there is something about vintage clips like this that I find strangely compelling. Film Restoration (HD, 4 min) - This featurette provides a short but interesting look at the restoration techniques used on the film. We see how scratches, missing frames, and audio clicks were corrected through computers. Original Theatrical Trailer (HD) - The movie's theatrical trailer is included. Restoration Trailer (HD) - The trailer for the film's 1995 restoration. Stills Gallery (HD) - 111 stunning production photographs, behind-the-scenes stills, and posters, are included in 1080p. 'Beauty and the Beast' is everything fantasy on screen should be. It's simple, enchanting, and beautiful, forming a timeless treasure that has and will continue to stand the test of time. The video and audio are both respectable, but do show the limitations of their sources. Supplements are great, providing some nice insights into the production. This is a stunning film and a great disc, one that comes highly recommended.